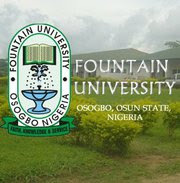 Fountain University is owned by Nasrul-Lahi-L-Fatih Society of Nigeria (NASFAT), LICENSED in May 2007 by the Federal Government and commenced academic activities in January 2008. Must possess P.hD from recognized institutions with minimum of 9/10 years teaching experience. Candidates must have strong record of publications in relevant and reputable national and international academic journals and to her publishing outlets. In addition, candidates must also possess some measure of experience in administration of academic Units and University Governance. ICT competency is a requirement. Must possess the above qualification and must have minimum of 6 years cognate experience. Must possess a minimum of Ph.D or a Master Degree with adequate numbers of years relevant teaching experience and must demonstrate highly scholastic promises terms of publication. ICT competency’s relevant. Must possess a minimum ofM.SC with not less than 60% weighted Average Score pr preferably a registered student. Doctorial student in recognized university ICT competency requirements. Applicants must possess a good degree in any Engineering, Architecture, Regional Planning and any relevant disciplines from recognized University. In addition, applicant must be a registered member of a Professional body in the relevant discipline such COREN, ARCON, NIA etc and have at least 15/12 years of cognate experience in Works & Physical Planning Department in an Institutions and Higher Learning. Salaries and conditions of services are very attractive and comparable to what is presently being paid in Federal Universities. Applicants are required to submit 15 copies of their application and CV addressed to the Vice-Chancellor, Fountain University, P.M.B. 4491, Osogobo, Osun State not later than 21 days of this of this advertisement.